We’ve spent the last month adding capabilities that many people have been asking for since we started our beta. We’re happy to announce that you can finally teleport between Kitely worlds. In addition, Kitely Plugin now supports many popular viewers that didn’t work before. Teleporting between Kitely worlds finally works! If you try to teleport to a world that is online then you’ll be teleported to it immediately. If you try to teleport to a world that is offline then the world will be started; you’ll remain active in the world you are currently in; and once the destination world is ready you’ll be teleported to it automatically. Teleports are also connected to the website: if you click “Enter World” in a World Page, and you are already in another Kitely world, then you will be teleported to the new world. This means that you no longer have to close the viewer to switch between worlds. When Kitely Plugin is installed, if no supported viewer is detected then we show a button called “Install Virtual World Viewer”. This button lets the user download a default viewer, Firestorm, directly from world pages. In the past Imprudence was the default viewer. However, Imprudence doesn’t support new features such as Media-on-a-Prim and meshes so we decided to change the default viewer to Firestorm. It is now possible to select which viewer Kitely Plugin will start. This is done from the Settings page in your account. The list of viewers that you will see includes only viewers that you’ve installed on your computer. Please note that the plugin only detects a viewer if it’s installed in the default location that was suggested by the viewer’s installer. Therefore, we recommend that you always install viewers in their default path. This feature was highly requested by our users. In the past it was possible to select the viewer Kitely Plugin will start by modifying a configuration file. However, this was error-prone and complicated. We’ve therefore removed support for that configuration method and added the list of viewers instead. 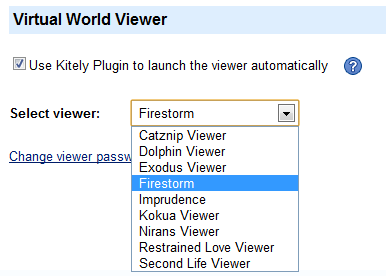 You can now enter Kitely worlds by starting your viewer manually, without using Kitely Plugin. This is useful if you can’t install Kitely Plugin (e.g., because you’re on Linux), or if you want to use a viewer that Kitely Plugin doesn’t support. Add Kitely to your viewer’s grid manager. See our viewers page for details. Go to a World Page and click “Enter World”. Once the world is ready, you’ll be asked to start your viewer (see screenshot below). Start your viewer; select Kitely in the grid manager; enter your login information; and click “Login”. You will then enter the world! We are excited to announce that Facebook is no longer required in order to use Kitely. We now support two of the virtual world community’s most commonly requested alternative login options: using a Twitter account and using an email and password. We still support Facebook logins as well, but you are no longer required to use them. Click on the Twitter button to connect your Twitter account to Kitely. You can login to Kitely using Twitter. Your name will be linked to your Twitter profile in places such as World Pages and the History table, so that people can see who you are and perhaps follow your tweets. You can use Twitter to restrict who may visit your worlds, if you wish. For example, you can allow only your Twitter followers to enter your worlds, or choose any Twitter List that you subscribe to. UPDATE March 18, 2015: Facebook will soon stop providing the list of groups their users belong to, so we removed the option of using Facebook Groups for world access control. If you don’t want to use either Facebook or Twitter then you can create an account using an email and password. In the login dialog, click Create a new account and enter your details. Please note that we recommend using Facebook or Twitter to create accounts, because they allow you to use Facebook Friends and Twitter Lists to manage world access controls. An Email/Password account doesn’t have these options, so it’s less flexible in managing world permissions. In addition, Facebook and Twitter accounts are more secure because they don’t require you to create and remember another password. If you are considering creating an Email/Password account because you don’t want your real identity to be known then we recommend creating a new Twitter account instead: you can hide your real identity that way as well, and you will still have access to all the great features that are only available to Facebook and Twitter users. Nevertheless, if you don’t want to link your Kitely account to an external account then you no longer have to do so. If you create an Email/Password account then you won’t have a profile image initially, because we get those images from Facebook and Twitter. (The profile image appears in the World Pages of worlds that you create.) However, you can add a profile image by creating a Gravatar. Gravatars are a widely used standard for linking an image with an email address. We now allow the use of some OSSL scripting functions. These are scripting commands specific to OpenSim (they’re not available in Second Life). We’ve set the “threat level” to Low, so the following function groups are available: None, Very Low and Low.